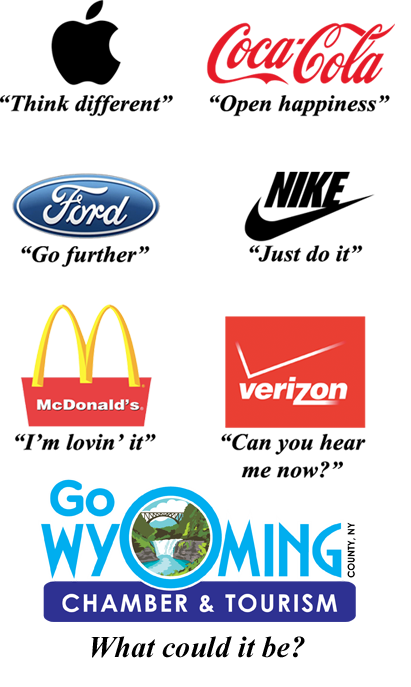 To celebrate National Tourism week this year May 5 - 11, 2019, the Wyoming County Chamber and Tourism office is kicking off a fun contest to come up with a new tagline that will help brand, identify, invite and welcome people to Wyoming County. The entry period begins on May 5, 2019 and runs through 5:00PM on May 20, 2019. The tagline should be no more than ten words to make it quick to read and catchy. Three entries are allowed per person, and all ages may participate in the contest. You do not need to be a resident of Wyoming County to enter. The tagline should describe the best of Wyoming County. It should convey how we represent our home to visitors. The tagline should paint a picture of what is being described, the experience of the place, or the uniqueness of Wyoming County. The tagline should try to avoid being too trendy or seasonal in nature, as we would like to use it for the entire county all year long. Try to make it memorable, for example, would it look good on a poster or a billboard? Be inspired, think of things in Wyoming County, and how they make you feel, then come up with a great tagline that evokes those feelings. Following the close of the entry period, a committee will take all of the entries and narrow them to three finalists. The top three will then go out to the public for a week of voting via social media and the winner will be announced on June 10, 2019. The Wyoming County tagline contest winner will receive a $50 Wyoming County Visa gift card – and most importantly – well-deserved bragging rights! Entries can be made by mailing them to Wyoming County Chamber and Tourism at 36 Center Street, Warsaw, NY 14569, emailing them to info@gowyomingcountyny.com, or on the web at www.wycochamber.org.